These words remind me that all that is truly great about our nation begins first with the individual. America is a nation of individuals; she is a rich and beautiful tapestry that is woven from, and continues to be woven from, the talents, character, experiences, and determination of her people. America, in her splendor, shines when her people unite to support the individual by upholding the ideals on which she was founded. The indivisibility of our nation is possible when we recognize that the durability of the American fabric is contingent upon the inclusion and strength of each individual thread. America succeeds when the voices of all Americans are heard and when the needs of all Americans are supported. Liberty Enlightening the World is a powerful symbol of America’s indivisibility. It recalls a time when people, united and acting in a singular way, recognized the individual’s right to life, liberty, and the pursuit of happiness. 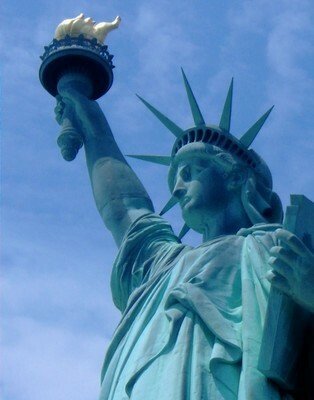 Perhaps today the light of Liberty’s torch could be directed homeward, illuminating and reminding the American government and people about what we, as Americans, truly value. This blog comes in response to an email I received from Starbucks. In it, Starbucks chairman, president, and CEO, Howard Schultz shared his desire for people to come together and put citizenship over partisanship. The result is a national conversation called #Indivisible. I liked this idea and challenged myself to put into words one idea I believe. If you’d like to join the conversation, check it out at indivisible.tumblr.com. And/or share your thoughts with me here – we can have our own conversation, too! « It’s Time For A Parade!